One of the highlights of traveling in Peru was arriving in Barranco, an artsy suburb of Lima right on the ocean, and eating my first big plate of real Peruvian ceviche. It’s fairly simple. The fish is marinated in lime juice and served with sweet potatoes, red onions, peppers, and large crunchy corn kernels. The timing here is important. You need to marinate the fish long enough so it’s “cooked”, but not too long that the citrus takes over. I found that with ½” – ¾” cubes of fish, 45 minutes was a good amount of time. I used local gulf Drum and Sheepshead that my family had caught the day before (make sure it’s fresh! ), but any mild white fish, such as snapper, trout, or flounder, will do. Save the leftover juices, or leche de tigre, for a hangover cure the next morning. Place your sweet potato in a pot of water, and bring to a boil. Boil until easily pierced with a knife, about 20-25 minutes. Remove from the water, and when cool, peel the skin and cut the potato into cubes. 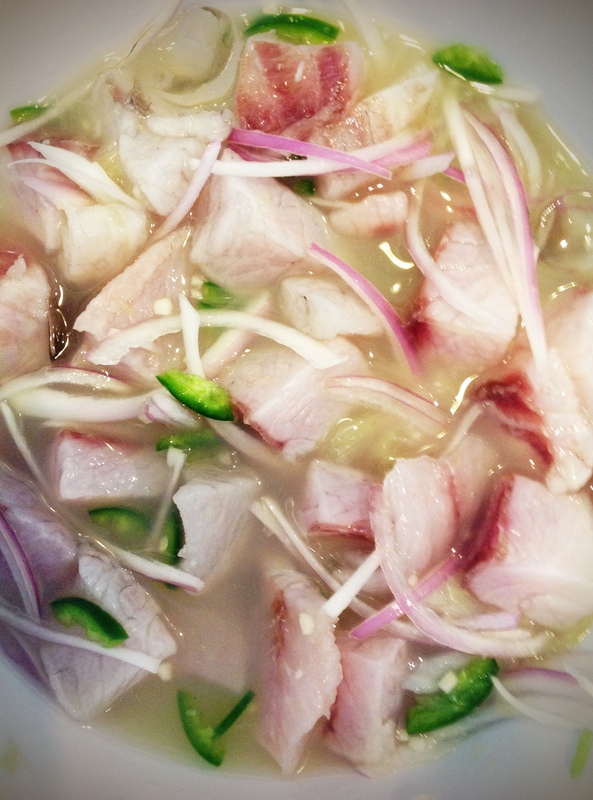 In a large bowl, mix the fish with the lime juice, shallots, garlic, and jalapeno. You want enough lime juice to cover the fish, so you may need more depending on how much fish you have. Add a few ice cubes, and place in the refrigerator for about 45 minutes. It will be ready when the edges are opaque, but the inside is still a little pink. 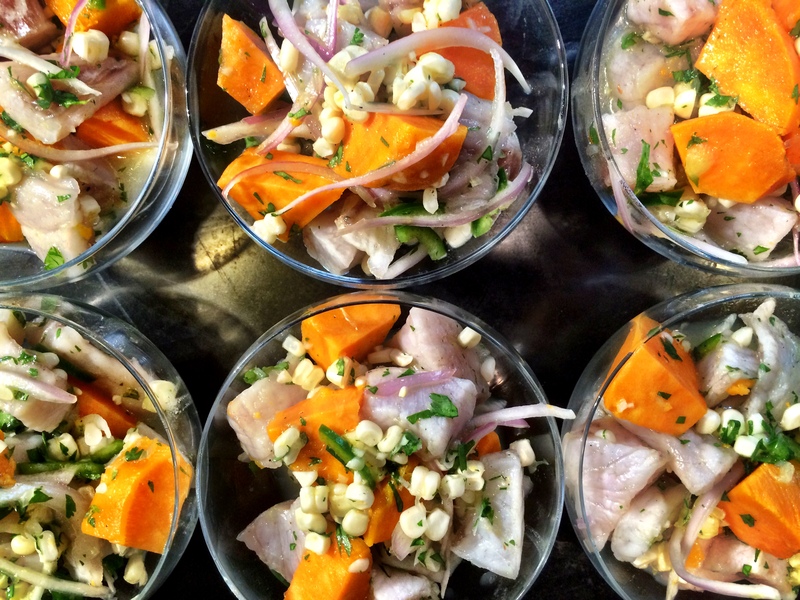 When the fish is ready, mix in the raw corn, sweet potato, and cilantro. Season with salt and pepper, about 2 tablespoons of olive oil. Drain and reserve any excess lime juice, and add a few squeezes of orange juice. The orange juice helps balance the lime flavor. Dish your ceviche into serving bowls, and top with the reserved lime juice and salt if needed.